After years of testing, the FDA today approved a new type of prosthetic arm that its makers claim will bring a whole new level of control to amputees. Known as the "Luke" arm or DEKA Arm System, Segway inventor Dean Kamen has been involved in its development and unlike existing prosthetics, it can understand multiple commands at once, giving its wearers "near-natural" control of the limb. As demonstrated in the videos embedded after the break, tests show wearers can get back to easily performing tasks like using keys and locks, brushing their hair, removing papers from an envelope, or picking up an egg without breaking it. While we've seen demos using other mind control techniques, the one approved for sale does its magic with electromyogram (EMG) sensors activated by the wearer contracting muscles close to where the prosthesis is attached or on their feet, which an embedded computer translates into movement. Another triumph here is the (relative) speed of its approval. Fast-tracked in the FDA's 'de novo' classification process, the DARPA-funded project has gone from idea to ready for the market in eight years. 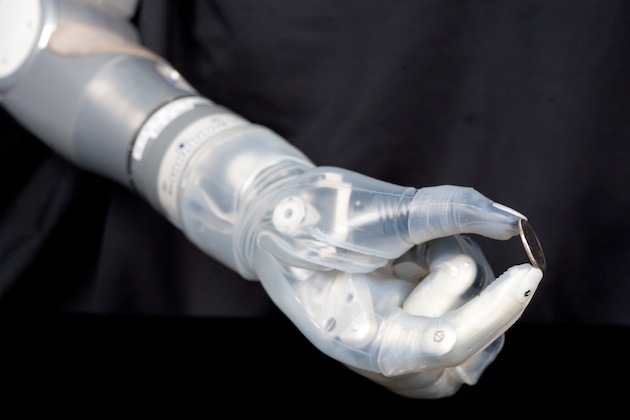 Bloomberg reports that the government agency put up $40 million to help develop the device, which is modular enough to fit people who have any degree of loss, from a hand to the full limb. Going far beyond the metal hooks that have been commonly fitted to those with upper limb amputations, it's battery powered, "similar" in size and weight to a natural limb and has six different grips. It's capable of recognizing up to 10 specific movements There's no word on how much the device will cost, but Next Step Bionics & Prosthetics president Matt Albuquerque says now it will look for a commercial partner to start mass production.